I spent my Saturday absolute satisfied by cooking a good dinnner based on inspirations over the week and I also decided to bake. I had no idea what I wanted to bake, and I wasnt keen on my same old cookies or pre-mix boxes. Thus, I explored the recipes of Nigella Lawson as everyone knows, the desserts she brings to the table is absolutely to die for. I wasn’t prepared to travel far just to get ingredients like cream cheese or shortening etc, so I had to keep to a simple recipe yet some how still delicious and comforting. I decided to go with her Banana Butterscotch Muffins and tweaked a little bit here and there to suit our taste buds at home. I went with a nice mix of Banana, Milk Chocolate Chunks and Earl Grey Mix, I wasn’t all too sure about the earl grey but… IT WORKED! So here’s sharing the recipe! Again, credits to Nigella (original recipe) whilst I made some minor adjustments. Preheat the oven to 175°C/gas mark 6 and line a muffin tin with muffin papers. Mash the bananas and set aside for a moment. Pour the oil into a jug and beat in the eggs. Open the teabags and pour the tea leaves into a small bowl, pour approximately 10-20ml of hot water onto the tea leaves. Put the flour, sugar, wet tea leaves, bicarbonate of soda and baking powder into a large bowl and mix in the beaten-egg-and-oil mixture, followed by the mashed bananas. Fold in the chocolate morsels, then place equal quantities in the prepared muffin tin – I use an ice cream scoop and a spatula – and bake in the oven for 18 minutes. It doesn’t look like what Nigella did but hell I’m no professional baker right! What matters was how the banana and chocolate marries perfectly. How the earl grey made the muffin so much more fragrant. 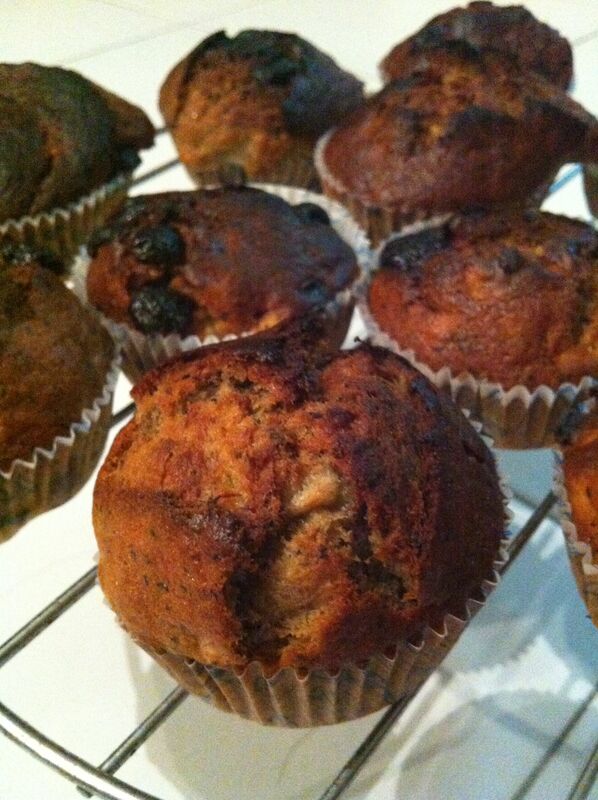 How when its warm, the chocolate just oozes and the brown sugar made the muffins moist and slightly caramelized. and guess what! i only took 20 minutes to mash, chop and stir in all the ingredients. the baking takes long but in that 18 minutes it is baking I’m enjoying myself else where. I’M IN LOVE WITH THIS RECIPE! I’m already thinking of other moist alternatives that would work!! Let me know if you have ideas and if you also tried it!